In our Stepping Stones Montessori Long Day Care our children are grouped in ways that ensure they are well cared for and where their needs are met. Language acquisition and the development of independence, concentration and movement are the educational focus for the children in our community. Brain development is supported through the sensory experiences and the refinement of voluntary movement. This is central to our program and our well-prepared environment supports this development by providing activities specifically designed around the sensitive periods of your child’s development. Our children are provided with a cozy, warm and nurturing atmosphere that is calm and that mirrors what usually characterizes the home environment. There is a consistency of layout and order which helps each child to feel secure. All of your child’s needs are catered for with areas for sleeping, active time, eating and physical care such as toileting and nappy changing. 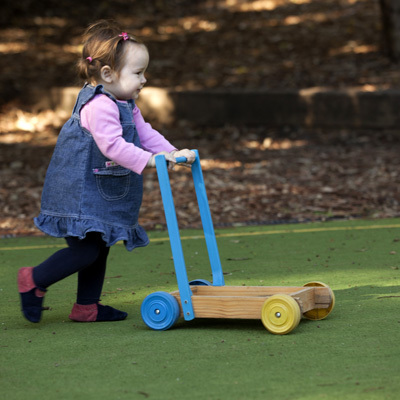 At this age of development, movement is at the very centre of a child’s life. Your child will be involved in the exciting task of learning to move efficiently in their world. Movement aids in discovering and reinforcing a variety of perceptual motor and academic concepts. The strong correlation between movement and brain development is central to the activities we choose to place in this environment for our children. It is through these actions that each child’s self-esteem, independence, concentration and confidence can emerge. The 3 to 5 yr old, in a cooperative and non-competitive environment, experiences the joy of learning and the acquisition of real self-discipline. 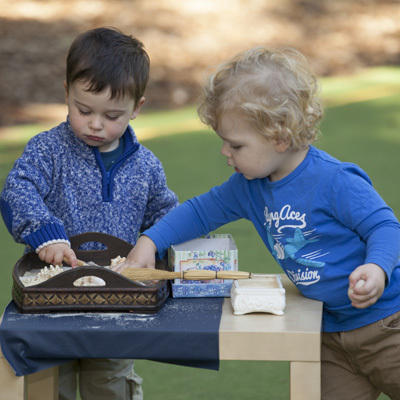 Through our individualised focus on your child, the careful preparation of the environment and the right guidance, we create a space where your child can be free to explore and experiment with their world. Spontaneous activity in a respectful environment will not only foster independence but develop your child’s social skills repertoire. Starting before birth and carrying on to approximately 3 years, the child is geared to effortlessly acquire spoken language which then forms the basis for the child’s literary skills. Thereafter, the sensitive period for language continues as the child develops written language (writing and reading) until this highly sensitive period finishes around the age of 6-7 years. The sensitive period for Order is at its strongest during the ages between 6 months and 2 years, becoming less important thereafter. This sensitivity for order helps the child to classify information in their world such as shades of red and differentiation in size. A special ability to notice the tiniest details exists between 18 months and 2 ½ years. This is often manifested when looking at books or exploring nature. A sensitive period for nuances in sight, pitch, taste, smell and touch exists between birth and approximately 3 years of age. 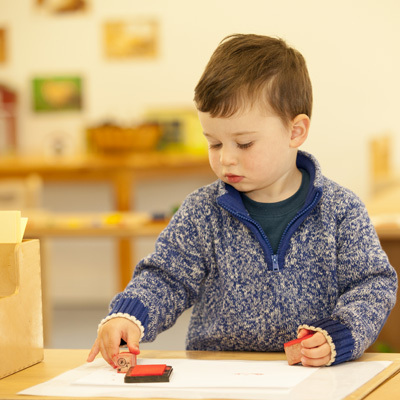 Thereafter between 3 to 6 years (the Montessori preschool stage) this ability is refined. Between approximately 2 – 3 years there is a heightened sensitivity for different experiences of touch. This is referred to as the sensitive period for development of the stereognostic sense i.e. distinguishing shapes by touch alone.